Global sea levels are rising constantly. One factor contributing to this rise is the melting of the glaciers. Although the surface area of the glaciers has been well mapped, there is often no information regarding their thickness, making it impossible to calculate their volume. As a result, researchers cannot accurately calculate the effects on sea levels. Dr. Johannes Fürst from the Institute of Geography at Friedrich-Alexander-Universität Erlangen-Nürnberg (FAU) has developed an approach to draw up regional ice thickness maps for glaciers. He has now produced such a map for Svalbard and published his findings in Geophysical Research Letters . Fürst gathered and evaluated data measured by a number of international research teams since the early 1980s. 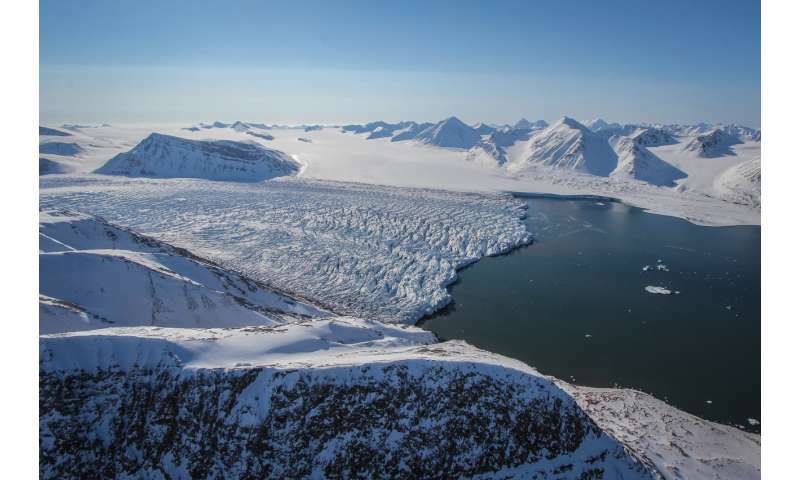 These measurements have been entered into the new map of glacier thickness on Svalbard, an archipelago to the north of Norway with the main island Spitsbergen. Whereas previous studies have only looked at individual thickness measurements in isolation, projecting the total ice volume evolution on the basis of the surface area and just a few measurements, this map takes all available measurements into account in order to obtain a reliable estimate of the total ice volume. At 6,200 cubic kilometres, it is approximately one-third smaller than previously presumed. Nevertheless, if this ice were to melt suddenly, it would still cause global sea levels to rise by 1.5 centimetres. Fürst also provides an associated map of error estimates. Errors may be a direct result of the thickness measurements. At these locations, errors can readily be calculated. It is more difficult for positions away from the measurements. Starting from a certain measurement point, errors are estimated along a flowline down the glacier based on speed, direction as well as local mass gain and loss. Researchers could also use this formula to calculate the ice thickness uncertainty for regions where hardly any measurements have been taken. "In order to calculate the future demise of glaciers accurately, we have to know the thickness of the glaciers. Until now, however, we have only had very rough estimates, which vary greatly. This is down to the lack of measurements taken worldwide. My approach, which can also be used for other glaciers, may help in this respect," Johannes Fürst explains. There are nearly 1,700 glaciers on Svalbard. On these, 1 million point measurements of the ice thickness have already been collected, ranging in date from the 1980s to the present day. These measurements have mainly been provided by British, Spanish, Norwegian and Danish teams of researchers, but Polish, Icelandic, French and Japanese researchers have also collected valuable data. One method of determining the thickness of the ice cap is using radar. A radar signal is sent down through the ice. The longer the signal takes to return to the measuring device, the thicker the ice is. "It's like ping-pong: The table tennis player hits the ball and waits until it comes back. The longer he has to wait, the further away the ball was," explains Fürst. Another method involves making several boreholes through several hundred metres of ice. The extracted ice cores were used, for example, to study past fluctuations in temperature or precipitation. A mining company has also used drilling in order to better judge the risks of mining for coal underneath the glacier. Fürst has included all these measurements in the ice thickness map. The ice thickness map gives new insights into the dynamic ice loss of glaciers. When new snow falls, its weight compresses previous layers of snow and a new mass of ice gradually forms. This ice then flows downglacier, in some places until it reaches the ocean. Huge icebergs regularly break off from the ice cliffs there. The mass lost there every year can only be estimated accurately if the thickness of the ice at the ice cliffs is known. Johannes Fürst has calculated an average thickness of 135 metres for all marine-terminating glaciers in the Svalbard archipelago. The previous estimate was 214 metres. Thanks to the new map, researchers are now able to estimate the dynamic ice loss from Svalbard glaciers accurately.